Deep-fried uni, anyone? Head for Ebi 10. 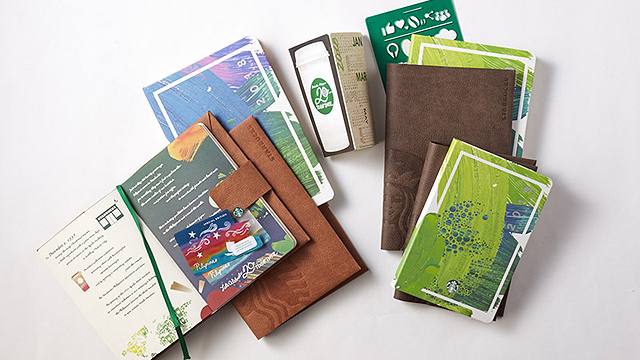 (SPOT.ph) Even with its growing popularity, Poblacion in Makati still manages to surprise. 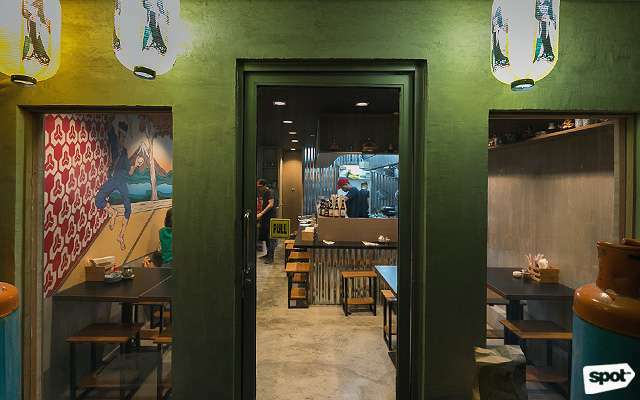 In fact, one of the newest joints to join this neighborhood’s vibrant dining scene is pretty easy to miss, so keep your eyes peeled. With a little sleuthing, you might stumble upon a “secret” nook that could just be the solution to your late-night deep-fried cravings. Walk the narrow alley beside Tambai Yakitori Snackhouse to reach Ebi 10, the newest addition to an area that’s now dubbed “Tambai Alley.” Like following a rainbow to reach a pot of gold, you also get a pretty sweet reward here: Crisp, golden-fried tempura. 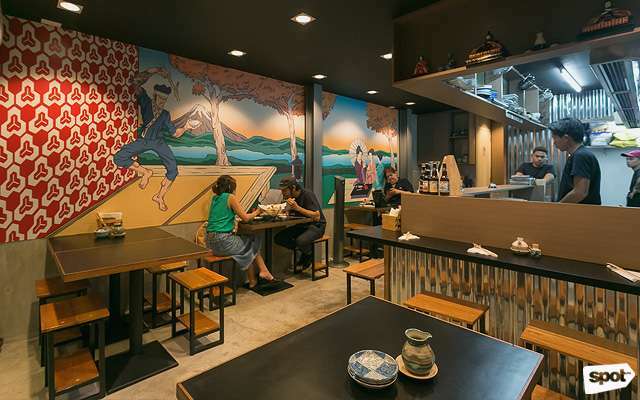 The inspiration is evident in the set-up, which resembles a Japanese hole-in-the wall, with a bar-like counter at the center where customers can dine while watching the open kitchen fry up tempura, and several tables, perfect for small groups or couples on a casual date. A lively mural done comic book-style by artist Frank Perez adds a colorful contrast to the more minimalist, wood-based interiors. 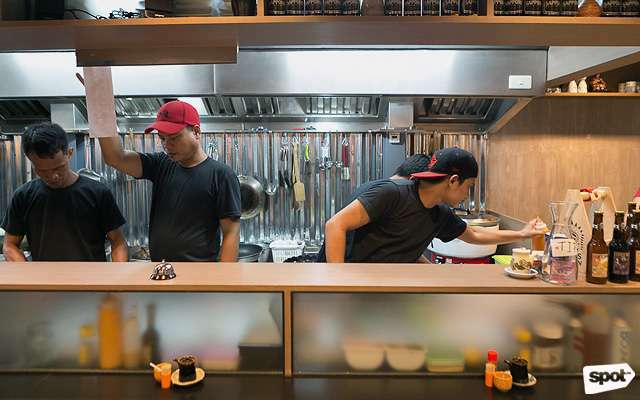 “We wanted this space to feel small and intimate, like a real tempura bar,” says Marco. If you judge tempura by the batter, Ebi 10’s will win you over, with a tempura coating that’s light and crisp with the slightest whisper of buttery saltiness. Marco shares that they massage their prawns—which come in regular or jumbo sizes—to soften them up a bit before coating them in batter, and frying them. 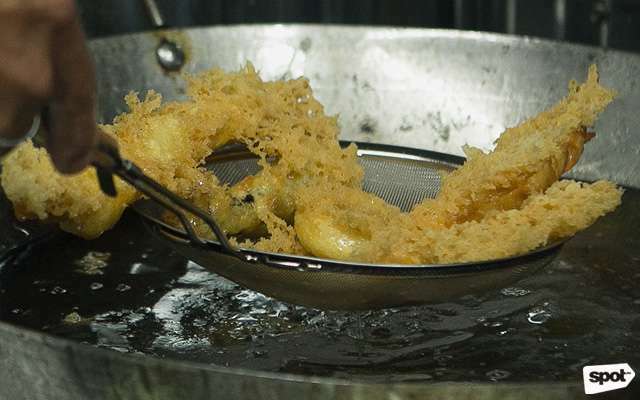 They also throw in a bit of batter in the piping-hot oil while frying, to give their tempura crisper edges. Surprisingly, their ebi tempura tastes practically greaseless, the light saltiness of the batter adding an extra kick of flavor to the fresh prawns. It’s tempting to play it safe and opt for a basket of their Small Shrimp (P45/piece) or Jumbo Shrimp (P120/piece) tempura—which isn’t a bad idea, mind you. But, it’d be a shame to miss out on the rest of Ebi 10’s tempura variants, which they let you order per piece for your made-to-order tempura basket. Their Uni Shiso Nori (P180/piece) in particular is excellent. 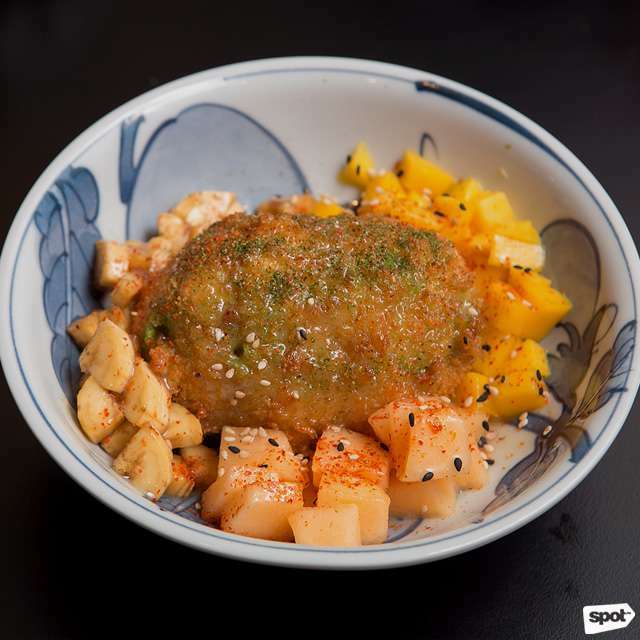 Soft, almost melt-in-your-mouth uni is wrapped up in crisp nori sheets, coated in tempura batter, then deep-fried—the result is a delightful symphony of contrasting textures, the uni bursting out of its crispy casing with a single bite. 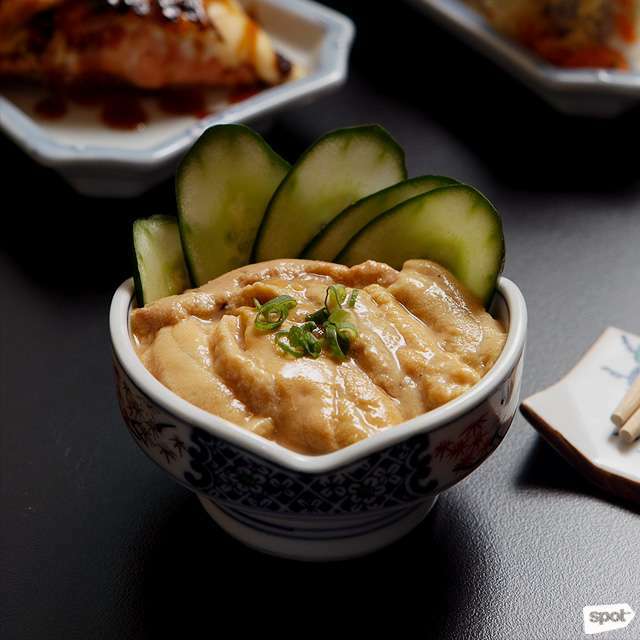 The batter is seasoned lightly enough, too, allowing the fresh briny flavor of the uni to shine through. An order of their Uni Shiso Nori is guaranteed to make you crave their fresh uni even more; lucky for you, you can also get it as Uni Sashimi (P390), a bowl of fresh, buttery uni you can enjoy as is or dipped in their sushi sauce. But, back to your tempura basket. 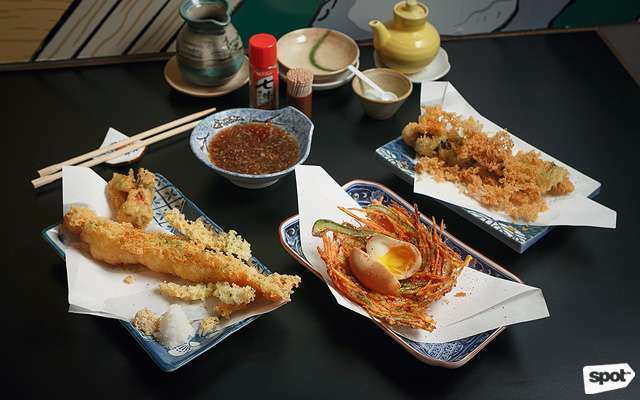 Work your way through Ebi 10’s menu, and fill it up even more with some Japanese classics: The Ika (P45/three pieces) or squid rings are tender with a pleasant bite. Something a little offbeat is the Beef and Mango (P60/piece), but don’t knock it till you’ve tried it. Mango slices add a zesty sweetness to the more savory beef, making this the perfect tempura for anyone who enjoys sweet-salty combinations. Though tempura is undoubtedly the star at Ebi 10, their version of other Japanese favorites also deserve attention. 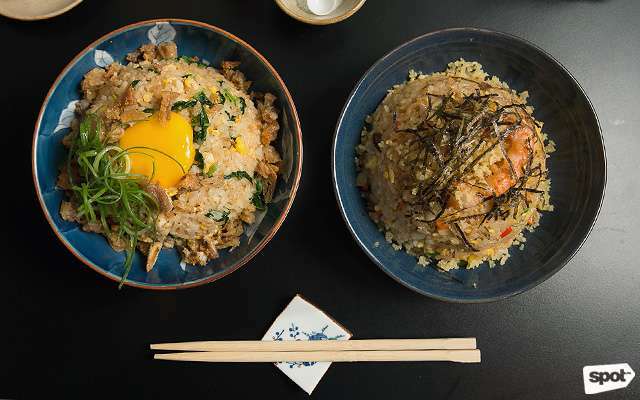 Pair your tempura with a bowl or two of their fried rice: The Ebi 10 Chahan (P150) is so full of savory umami goodness, you’re in danger of finishing a bowl by itself. Or you go another route and have your carbs through the Bacon Yakisoba (P150). 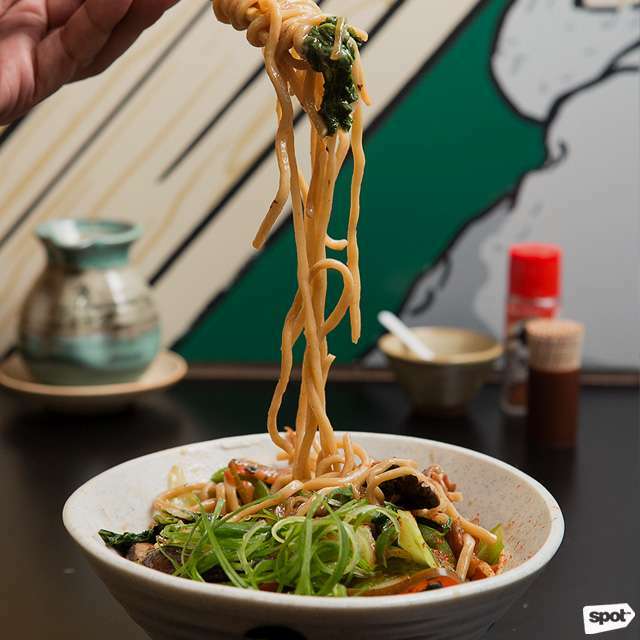 Soba noodles made in-house are stir-fried in truffle oil—a fact you can attest to from the mouthwatering aroma that wafts from your bowl. It’s rich and greasy in a comforting way, with thick chunks of fatty bacon adding a salty bite here and there; it’s a bowl you’ll want to have after a couple of buzzy drinks. 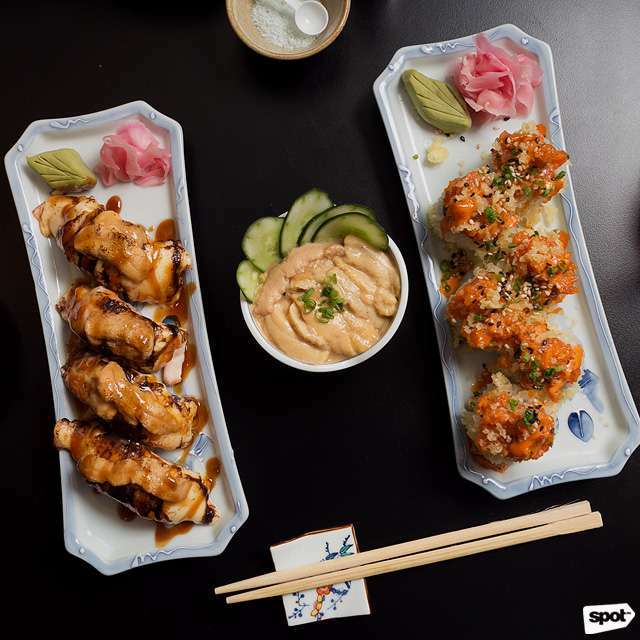 While Ebi 10 wants you to “control your tempura,” what you certainly won’t be controlling here is your appetite—though sampling every kind of tempura on their menu can be a challenge. 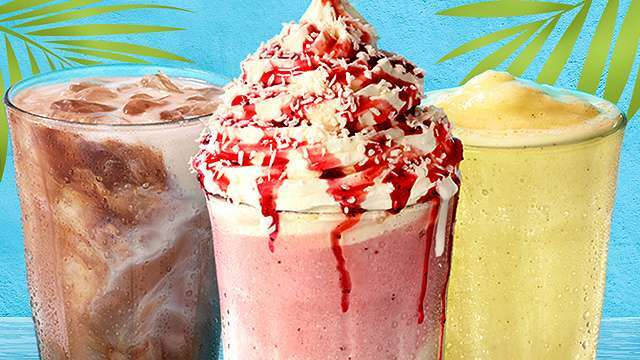 It doesn’t help that they’re planning to add even more to the menu—beef and perhaps even lobster, might make their way on to the list. You’ll just have to come back again and again.